Before you read any further, a note about the sweater pictures below. I really wanted to get some good natural light shots, but the weather did not cooperate (overcast on Saturday, snow squalls on Sunday). What follows are our best attempts to capture this gorgeous, multifaceted yarn under artificial light. Please, don't hate the model or the photographer -- we know we're not worthy. My coworker commissioned me to knit her this sweater way back last fall. I started it and made some decent progress on the yoke before I put it down in favor of my holiday knitting. I picked it up again and starting working on it seriously again earlier this month. The yarn really makes this sweater, and unfortunately these pictures just do not do it justice. It's a deep, plummy purple shade, but with flecks of reds, blues, and grays. The sweater itself is a basic raglan construction, but the drape of the yarn is just wonderful. I did have some issues with the pattern, none of which was too difficult to overcome. The first issue came with the decreases for the body. The pattern calls for the decreases to be done on right-side rows every 9th row; however, if you follow this direction, you will alternate between doing the decreases on the right side and on the wrong side. Instead, I did the decreases every six rows, ensuring they were all done on the right side (I threw in a couple of increases as well, since I was lengthening the body). 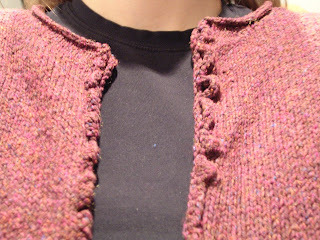 Then, when knitting the button bands, I had to account for the extra length and added some extra stitches. I wasn't quite sure exactly how many to add, so I picked up and knit four at the collar (I disregarded the pattern and knitted the button band on to it) and four along the hem at the bottom and picked up one stitch every other row in between the two areas. As you can see, the button bands really aren't that visible once you add the ruffle, which is such a nice finishing touch. I used a slightly larger crochet hook than what was called for (it was the smallest one I had on hand) and did only one double crochet per knit stitch, as I discovered that two dc's per knit stitch was way too crowded. I delivered the sweater to its owner this morning and she was just thrilled. Carrie commented on my last post that I was an awfully generous knitter, knitting a whole sweater for someone else. Well, dear readers, I'm afraid at this point I must fess up: I didn't just knit her the sweater out of the goodness of my heart. As I said, I was commissioned to knit it. She purchased the pattern and the yarn; in return for knitting the sweater for her, I got to keep the pattern and was paid a small fee for my labor. All in all, I think it was a pretty good deal. The final verdict? It's a winner! The recipient loved it, as did everyone she showed it to at work today. I will definitely be knitting myself one, as I have a big stash of the silky tweed (originally purchased to knit a sweater for J, but then claimed for myself after I decided it wasn't manly enough for him). Although the coworker and I wear the same size, I'll be knitting my Marilyn a size smaller, as it has a fair amount of ease built into the pattern. I'll also be making it longer and with full-length sleeves. I won't be casting on just yet, however; I've still got several knits for others to finish up. It's been a very long day. I won't go into too many specifics, but I arrived home feeling like crap (still somewhat sick and didn't get much sleep last night). I was so ready to pull into the garage, lug my tired body upstairs, and climb right into bed, but I stopped to check the mailbox first. I'm so glad I did -- my Sockret Pal strikes again! but it looks groovy with this yarn! My pal once again sent me a package that wasn't really a package (i.e., just some goodies to tide me over until my final package arrives). On the left are two skeins of Knit Picks Memories in the Yukon colorway, destined to be a cozy pair of socks to keep my tootsies warm in this chilly weather we're having. On the right, two skeins of Knit Picks Gossamer (a laceweight) in the colorway Caribbean -- interestingly, I have two skeins of this in my stash, but couldn't decide if I wanted to use them for another Adamas shawl or for another Lace Leaf Shawl. Now I won't have to choose! Finally, up front, my pal enclosed some sock-shaped point protectors (which I will need quite soon on the baby blanket, as the rows are getting quite long). Thank you, pal, for making me feel so much better on such a cold, miserable winter day! I've told my coworker that she'd have it by Monday. Truth be told, I expect to be done by tomorrow or maybe Friday at the latest, but I really want to do a photo shoot over the weekend when J is home and give a good wet blocking. I've tried it on and it's definitely the right size -- just enough ease, which is specifically what she requested. Meanwhile, I've been working on another knitted item for a coworker, this time the baby blanket for a soon-to-be new dad. It's a little hard to see the detail of the log cabin action in this shot, but it's coming along nicely. I started it Saturday and have only knit on it seriously the past couple of days, and it's already about 15" by 18" and I'm on my third ball of the recycled yarn. Granted, I started with the smaller balls and left the two largest ones for last, plus there's still a piece of sweater I can unravel if necessary. 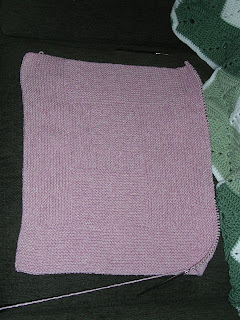 The plan is to keep knitting basically until I'm out of yarn, which I think should get me a pretty nice sized blanket. 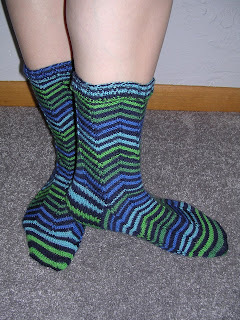 I've signed up for the Sock-a-Month 3 KAL, since I usually wind up knitting at least one pair of socks a month anyway. This'll be good motivation to knit my Sockret Pal's socks to start off with and then keep J's feet toasty (I'd like to do his red socks for Valentine's Day, if I can). Today I wore my new Jaywalkers to work, which was kind of funny, as they pretty much matched my sweater. 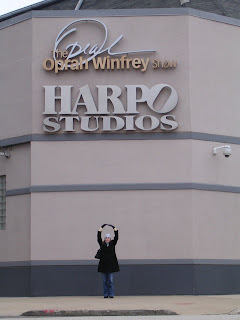 Wish I'd thought to take a picture; you'll just have to trust me that I was well coordinated. Although I was just sick last week, I seem to be either relapsing or coming down with another cold, so send out some good, healthy thoughts for me. Finally, I took a look at the calendar today and realized that the Knit & Crochet Festival is just around the corner and the deadline for advance (read: cheaper so there's more money to spend on diet-approved yarn) registration is a week away. I'd like to send in my registration form as soon as possible, but wanted to see when everyone else is planning to go. So, Pittsburgh-area knitbloggers, are you planning to go? If so, what day? I'm more inclined to go on Saturday, since Sundays usually wind up being errand/laundry days here chez Knit/Wit, but I'd love to meet up with as many of you as possible. Leave me a comment and let me know what your plans are! Mods: I substituted an Eye of Partridge heel for the slip-stitch heel, just to change things up. 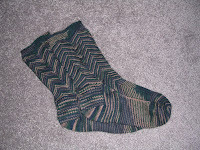 The self-striping yarn probably doesn't show off the heel that well, but it looks cool up close. To speak frankly, this pattern forms the best fitting socks for my feet that I've tried thus far in my sock knitting career. I encountered a slight hitch in the knitting of these socks in that the first attempt turned out too big (and unfortunately this error was only discovered after I was done with the gussets). So I completely ripped and started anew, and I didn't look back until I was done with both socks. 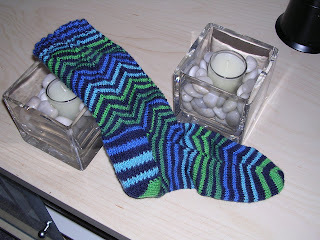 I'm thrilled with how these socks turned out -- they fit absolutely perfectly! -- and I can't wait to add them to my regular sock wardrobe. Anticipating the completion of these socks, I cast on for a new project last night, a log cabin blanket for my coworker and his wife, who are expecting a baby girl in early February. I'm using the yarn I recycled from that hideous Old Navy sweater way back in June. It's a great project to do when I'm watching a movie or doing something else that requires my attention, since it's all garter stitch. Unfortunately I've once again run into the problem of being tempted by a new and exciting project and being distracted from the WIPs that really need attention. I've made a decent start, but tonight and tomorrow I will turn my attention back to Marilyn. I've got half of the second sleeve done, so it probably only requires another couple days of work. At least I know this new WIP has to get done soon, too -- February is already next week! Forgive the boring title; I've been a bit under the weather the past few days and it's all I could come up with right now. So as far as this post is concerned, you'll get exactly what you're expecting. The past day or two the WIP that's seen the most attention is the socks on the left. Those are my Jaywalkers; the second sock has about three more inches of foot to go before the toe, and my goal is to finish the pair this weekend. 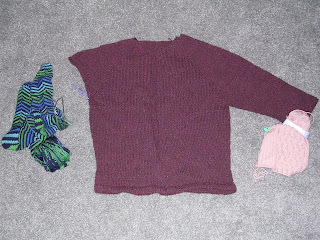 In the center, that big purple blob, is the sweater I've been knitting for my coworker. 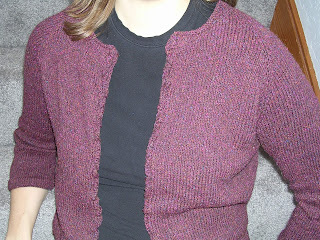 It's Wendy's Marilyn's Not So Shrunken Cardigan, which as you see is getting very close to being finished. I finished knitting the first sleeve the other day. The body is done, so all that's left to do is the second sleeve, the button bands, and the weaving in of ends and tacking down of hems. The lighting is this photo is awful, so you can't really see how gorgeous the yarn (Elsebeth Lavold Silky Tweed) is. Once this sucker is done, I'll do my best to get some natural lighting for the FO photo shoot. Finally, on the right, is my mother's tube scarf, which I literally haven't touched since last year (Christmas, probably). I have a sinking feeling that this is going to go the way of my tube scarf, which languished in the FO pile for nearly a year. My mother hasn't asked about it, and she's gotten another hand knit scarf since she asked for this one, so I may be able to get away with ignoring it for a while. There's another WIP not in this picture, and that's the first of the pair of socks for my Sockret Pal. I started it the night before I left for Chicago and got through the cuff and one lace repeat. The morning of my flight, I realized I'd missed the two knit rows between the two sections, tinked back twelve rows, and then knit the two rows and the first lace section again at the airport. I thought it best to not work on lace while on the airplane (anxiety and turbulence not making for ideal lace knitting conditions), so I switched over to the Jaywalkers and haven't gone back. Once I finish the second sock for myself, I'm going to force myself to go back to that first lace sock. I started out with the size 9 needles called for in the pattern, but got nowhere near gauge (19.5 sts and 27 rows over four inches) and didn't particularly care for the quality of the fabric either. So I went down a size and was much more pleased with the results: a drapey fabric, but not too loose -- not to mention spot-on stitch gauge. My row gauge is slightly off (26 rows rather than 27 over four inches), but that's easier to fix. I've got to remeasure J's chest once more, as I seem to have forgotten to write it down when I did the original measurement, and then I'm all set to go. Before I take on the sweater curse, however, I've decided that I really must finish my coworker's sweater. Right sleeve, here I come! 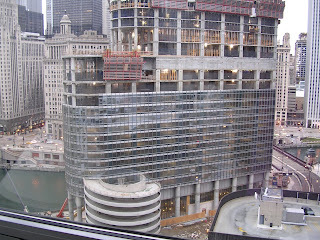 I am back from Chicago -- actually, I've been back for a full day. I was supposed to fly back this afternoon, but they were calling for a huge snowstorm in Chicago overnight Sunday into today and remember me? Ms. High Anxiety? Needless to say, I was freaking out. I was worried about getting stuck in Chicago and then getting home late and having to drive home from the airport in the dark and the rain, etc. etc. Plus I knew that I'd be such a nervous mess, I'd be really annoying to be around, and that wasn't how I wanted to spend my last day with J for the weekend. So we were able to switch my flight to Sunday afternoon, and today I spent the day going to the supermarket and then curled up with a good movie and my knitting. Ironically, the snowstorm never materialized, so I probably would have been fine, but just the same it was nice to have a relaxed day at home and get everything in order with plenty of time to spare before I have to go back to the grind tomorrow morning. Aside from that minor blip, the weekend was a lot of fun. I survived my flight into Chi-town (my first solo flight since 2005, I think) and had some good knitting time at the airport while waiting for J to get in from Cleveland. We had a late dinner with my cousin and several of her friends, then promptly returned to J's apartment and passed out. See that blue and white rectangle just above the red and silver section? Your eyes do not deceive you -- that is indeed a Port-o-John. 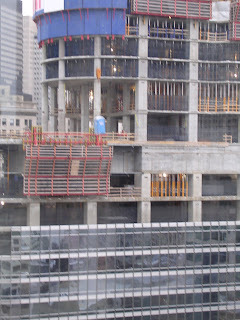 I was watching closely to see if they dropped it by accident; you'll be happy to hear they did not, and the construction worker supervising from the ground remained, er, unsoiled. and the cuff of the mate. And you know what? This one fits perfectly, so it was all worth it. I'm loving the pattern again, especially how well it fits my foot (at least when I follow the right set of directions) and how nicely this self-striping yarn suits it. Tomorrow it's back to work. I'm spending the night at my parents' (dad is away, mom and I will do some wedding stuff). My WEBS order with the yarn for J's sweater arrived today, so it looks like Wednesday night will be a winding party here chez Knit/Wit. I can't seem to put the Jaywalkers down, so expect a finished object report soon! model, the bannister will have to do. 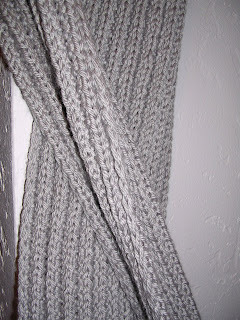 A detail of the slipped-stitch edging. This was a fast knit that I kept putting down in favor of other projects; had I not started it in the midst of all the holiday knitting, I probably could have finished it much faster. In any case, I will be taking it with me to Chicago this weekend, just in time to keep J's neck warm as winter seems to have finally arrived in the windy city. I had originally purchased six skeins of the Cashmerino for this scarf, but I stopped after four because I remembered how much my cabled tube scarf had bloomed and stretched with a good blocking. This sucker grew a full 15(!) inches. It's now long enough for J to wrap around his neck once or twice and tuck into his coat. An interesting side note: J and I made many trips into Banana Republic while we were on vacation. I've long since given up on finding anything for me there, so usually I wait while J looks around the men's section (of course I usually wind up examining the knitted items to see what I could make). 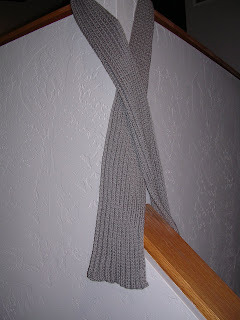 I kept going back to the scarves, because I was just so amused to see this one -- recognize the stitch pattern? Tomorrow I'm headed to Chicago for a long weekend with my J and hopefully visits with my aunt, uncle, and cousins. I will probably have some Internet access (that is, if J lets me use his laptop), but I don't know if I will be blogging. 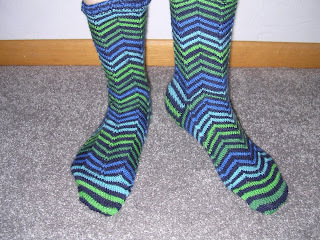 I am taking two pairs of socks with me (Jaywalkers for me, started last night, and socks for my Sockret Pal, started tonight), so there will definitely be some blog fodder for when I get back. Have a great weekend! There has been much talk 'round the internets about yarn diets and knitting from one's stash and so forth -- some of said talk has even occurred on this very blog. Yesterday I took a few moments during my lunch hour to contemplate my so-called yarn diet and what it should really mean to me. Some very astute readers made good points in commenting on my last post that the term "yarn diet" isn't perhaps the best one to use -- as Kenny so aptly said, the diet always starts tomorrow! I will knit only from the yarn I already own and therefore only patterns for which I've already purchased yarn. An acceptable purchase of yarn would be for a spare skein should I find myself in a yarn shortage situation. Yarn may be purchased for projects for others if they specifically request them (so the Cascade 220 I ordered on Monday is okay, as J asked for the sweater). Yarn purchased with gift cards or gift certificates is okay. Yarn may be purchased for my Sockret Pal, if needed. Purchases of needles and notions are acceptable, but they should ideally be for projects to be knit with stash yarn or for a Sockret Pal package. My plan is to follow these rules for the next month and then reassess. If it's going well, I'll continue another month. If need be, I will amend the rules. Care to join me in this stash-busting, wallet-enhancing (I hope!) experiment? What are your rules? So, now that that's taken care of, a quick knitting update. J's scarf is done (knitting was done last night, but not until right before I went to bed, so I had to do the finishing tonight) and is blocking on the floor in front of me. It bloomed nicely in its bath and should be nice and cushy for him to wrap around his neck against the Chi-town wind. The body of the sweater for my coworker is done and the hem has been sewn. I've a few more body ends to weave in, and then I'll begin on the sleeves. Meanwhile, it's been nearly two weeks since I had a sock on the needles and I've desperately been feeling the absence. I'll be taking my Sockret Pal's socks to Chicago this weekend (lots of airport/plane knitting time), but for now I'm off to cast on a new pair of Jaywalkers for me. ETA: Okay, since Jenn and Donna have reminded me of it, I must add another exception to the list: it is permissible to purchase yarn at once-a-year knitting events -- like, for instance, the 3rd Annual Pittsburgh Knit and Crochet Festival. I am a very bad knitter. Why, you ask? Simple: today I cheated on my yarn diet. In my defense, the yarn I purchased today is not really for me. No, I was seduced by and gave in to the allure of the wool because of my desire to keep my beloved warm during the cold winter months (especially now that he's in the Windy City during the week). Let me back up a bit. On Saturday afternoon, we were out shopping and J asked to make a stop at Banana Republic. He'd been in one in Chicago earlier in the week and had carried around a sweater he liked for half an hour before he remembered that he could buy the same sweater here and not pay tax. 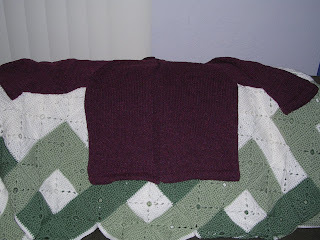 I immediately laughed when he showed me the sweater, because it was a simple stockinette with a rolled collar knit in cotton at a gauge of about 4 sts/inch. He decided to buy this one, but asked if I could knit him another one he'd looked at, a zip-up ribbed cardigan with a slight turtleneck -- ironically very similar to a pattern I'd shown him months ago. So one thing led to another, I showed him yarn colors, and the next thing I know I'm ordering an armful of Cascade 220. With any luck, by next week I'll be casting on (on size 9 needles -- ginormous!) 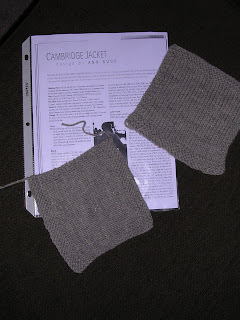 for the Cambridge Jacket from the summer 2006 Interweave Knits. Sweater curse be damned! Am I weak, or do I just really love my man so much I'll cheat? You be the judge (I'll do the knitting). 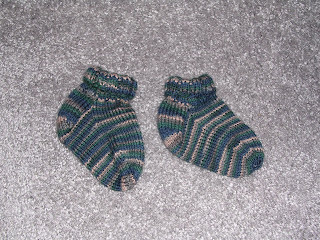 These socks are officially my first FO of 2007 -- hooray! I think it's only appropriate that they're socks, as I have a feeling that 2007 will be my year of socks. I fully expect to surpass last year's total of 21 pairs (must break into that sock yarn stash!). Speaking of stash, there was some stash enhancement this past weekend, thanks to a trip to Knit One. 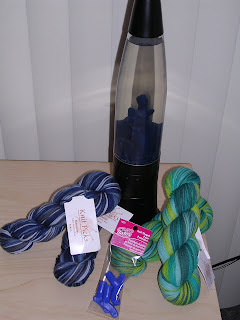 No, I did not violate the yarn diet; all purchases were made with gift cards I received as presents for Hannukah. Want a peek at the haul? That gorgeous blue there is two skeins of Malabrigo, which I'd been coveting since my last visit to the store. This will become a My So-Called Scarf for moi, as I've grown a little tired of my black pashmina-style scarf with my black winter coat -- I've definitely been needing a little color to help with the SAD. Next to that, in the back, are a skein of Trekking Natura (a wool/bamboo blend) and one of Austermann Step, which has aloe vera and jojoba oil in it and might help with the dry hands. In front are two more skeins of Dale Baby Ull, which is intended to be combined with the two blue skeins leftover from what I originally bought for the glittens for a pair of fair isle Norwegian-style stockings. Finally, you may notice in back what I really needed and what necessitated the trip to the store in the first place: three new pairs of Addis (in US 6 [24" and 32"] and US 4 [32"]). The 6's are needed for the sweater for my coworker, which is moving along quite nicely. I've finished all the decreases in the body and will put in a couple of increases in the four or so inches left to knit. Then it's just the sleeves (which will be 3/4 length), button bands, and ruffle, and in true SJ fashion, I've begun to really worry I'll run out of yarn. I'm on my fifth skein at present and will likely use most if not all of a sixth for the body. The ruffle is crocheted on, which means it will use up a lot of yarn, and that could spell trouble. Keep your fingers crossed for me! Fortunately yarn supply is not a problem for J's scarf, which I hope will see its completion by the middle of the week (I'm hoping to have it all blocked and ready to take to J when I go visit him in Chicago this weekend). I'm about to join the fourth and final skein, so look for a finished object report this week! I have been tagged for a meme by Cara, who has given me the letter J. The meme involves getting a letter and then listing 10 things/themes/ideas/etc. that are important in your life. So, without much knitting content to share with you at this juncture, here is my list! 3. Judaism I don't consider myself a very religious person, but my faith -- and, most importantly, its traditions -- are very important to me. It was essential to me to find someone with the same background as a potential mate, which was my reasoning for signing on to #2. 4. Joel -- Billy Joel Along with the Beatles, one of my all-time favorite artists. My very first CD, which I received on for my 13th birthday, was River of Dreams. I've seen him twice in concert, once when he performed at my college to tape a special for A&E. I'll never forget that concert -- I was in the ninth row in an auditorium that holds about 1,100 people. It was set up as Behind the Music-style show, with questions from the audience sparking discussions of the artistic process and performances of the songs that resulted. One of the most incredible moments (which never made it in the TV special, I should add) was when a friend of mine, himself a talented musician, got up and asked if, in the spirit of the master class, he could perform a song he wrote for BJ and get his feedback. He then proceeded to go up on stage and play a song all about how BJ had been such a huge influence on him artistically and how much he admired him. I don't think BJ was too pleased with this guy upstaging him, if only for a couple minutes, but the crowd just loved it. 5. Jeopardy! My favorite game show -- so much so that I've been known to answer questions in other games (like Trivial Pursuit) in the form of a question. It's one of my life goals to appear on the show, and I actually auditioned last May. I'm still waiting to hear from them -- they have another four months or so before I can take the contestant test again! 6. 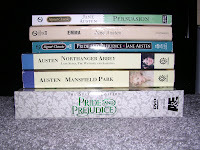 Jane Austen (Okay, technically she would probably be filed under A, but this is my list and I'm making it work, okay?) My favorite author, who I'd wish to be if I could live another's life. Or rather I wish I could have lived in her time, when people still corresponded with actual letters and had serious conversations and spent time doing pleasurable things like reading and embroidery. Although I've been known to say I have many favorite books, if I were completely honest I'd say Pride and Prejudice is at the top. I've read it many times and feel the need to reread it regularly. As it happens, I am watching my favorite film version of it as I write this post! 7. Jeans I like getting dressed up as much as the next girly-girl, but if I ruled the world, I'd wear jeans every day. I have almost an entire drawer full of denim. I own several different styles, but my favorites are Gap Long and Lean. 8. Java I am completely nonfunctional without my morning coffee -- you can ask J if you don't believe me. On weekdays I have two rather large cups before I leave for work, and on weekends I either brew my own or get a large cup at Panera. 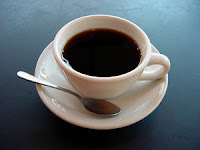 I like my coffee with lots of skim milk, but will drink it black or with sugar if only cream is available. My favorite flavor? Hazelnut. I've also been known to enjoy an espresso or two in the evening or when in Rome (or Florence, or anywhere in Italy, for that matter). 9. My last name Yes, I know what you're thinking: that doesn't start with a J! I'm not revealing my full last name for the sake of maintaining my privacy and anonymity, but suffice it to say that it does indeed begin with a J! Over the years many people have treated my first and last name as one continuous word. Although I'm planning on changing my name after I'm married, I have no doubt that there will still people who will call me by that one-word combined name. 10. Jaywalker This was the sock that started it all for me. 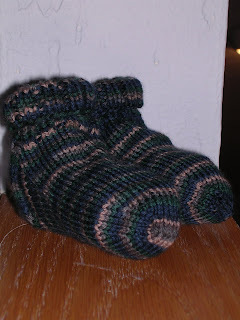 Although I started off last year by knitting J a pair of socks, these Jaywalkers were the first pair I knit for myself and they officially started my obsession with socks. These aren't exactly my favorite socks, as they're handwash only and a tad bit big, but they have a special place in my sock drawer and my knitting memories. See there, you did get some knitting content in this post! If you'd like a letter for this meme, leave me a comment! 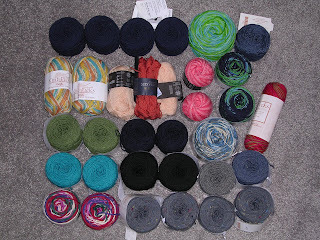 Now that the new year has officially begun, I thought it only appropriate to take a look in the stash to see just what it is I have to work with in the coming months (remember the yarn diet?). For all of the following photos, you can click on them to see the notes in Flickr and find out exactly what each skein is. The vast majority of this yarn is Knit Picks; their Essential is my go-to sock yarn for socks for J. It's superwash, comes in J-friendly (read: boring and muted) colors, and is highly affordable. 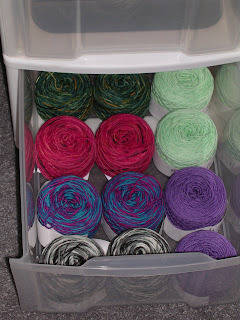 Then, there's what I call the "luxury sock yarn" drawer. This is the higher quality stuff, specifically Lorna's Laces Shepherd Sock and Koigu. See the black and white skeins at the front of the drawer? That's the very first Lorna's Laces I ever bought, and as you can see I haven't yet come up with a good use for it. The majority of this yarn, however, has specific patterns already selected. The green Koigu up top? That's destined to be a pair of Dublin Bay socks. The mint green Lorna's in the top right corner will be for Child's First Sock in Shell Pattern from Knitting Vintage Socks (a pattern I tried once before, but which came out way too small). The purple Lorna's skeins below that are for socks for my Sockret Pal. The blue and purple Lorna's in the middle will be a pair of Baudelaires. Haven't come up with anything yet for the pink/red Koigu or the black and white Lorna's. Ideas, anyone? 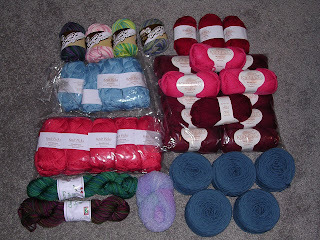 This would be the lace yarn stash. 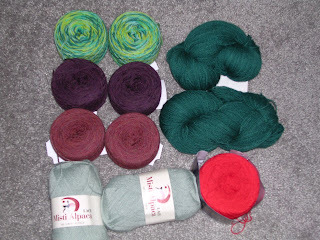 The six skeins at top left are all Knit Picks, and I have no project in particular in mind for these. The hand-dyed Peacock colorway (dyed for me by my Sockret Pal) in the top right corner will be a Shetland Triangle from Wrap Style. The bright red in the bottom right corner is intended for an Icarus Shawl, and the Misti Alpaca is left over from the shawl I made for my mother for her birthday; there's enough to make another of the same shawl, if I so desire. Finally, here's the yarn that's overgrown my storage bins and now lives in one of those big zippered plastic storage cases. With the exception of the three skeins of sock yarn in the lower left corner, the dishcloth cotton in the top left, and the three skeins of red Knit Picks Telemark in the top right, this yarn is all for sweaters. The light blue Knit Picks Shine Sport is enough for another Tivoli/Picovoli. The deep watermelon Knit Picks Shine Worsted below that is for another Sizzle (this one not so modest). The deep red and shocking pink is Knit Picks Merino Style for a Union Square Market Pullover. The French blue at the bottom right is Cascade 220 for Forecast, a sweater that I started last year but could never get gauge quite right. I've found my original swatches, so they will be ripped, washed, and re-swatched. 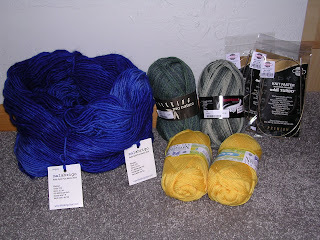 There's some yarn in the stash that I haven't shown you -- spare skeins of wool, random skeins of novelty yarn (some of which were freebies), some acrylic for baby knitting, and some recycled sweater yarn -- but I hope this gives you a sense of what I'd like to knit in the next year. What's on your to-knit list for 2007?